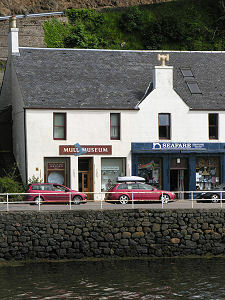 As Tobermory's Main Street curves around the north end of Tobermory Bay and starts to head towards the ferry terminal, it is easy to overlook the white-fronted Mull Museum, squeezed between the imposing Clydesdale Bank and the Seafare Chandlery. 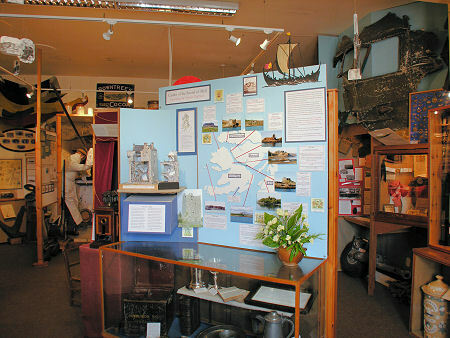 This small museum is run by volunteers, and depends entirely on membership and donations for its survival. 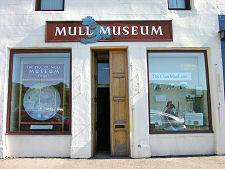 Despite its lack of external size, the Mull Museum packs a huge amount into what was once the village bakery. 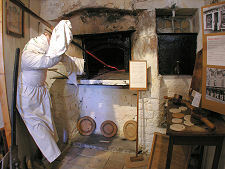 Evidence of its earlier life can be found at the back of the museum, where an exhibit has been created in which a dummy baker is found loading one of the original bakery ovens. Geography and the state of its road network means that Mull is an island that in many ways keeps itself quite private, even from the more inquisitive of its visitors. 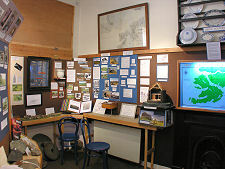 Mull Museum provides the perfect antidote to this, setting out for the benefit of anyone who cares to look, more about Mull's history, geology, geography, culture and people than you are likely to find in a shelf-full of books about the island, and all presented with an obvious and infectious enthusiasm. 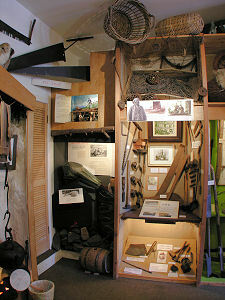 The displays within the museum are changed on a regular basis, a reflection of the fact that the amount of material available for display considerably exceeds the space in which it can be displayed. Nonetheless, the aim is to cover all aspects of the story of Mull. These cover the geological creation of the island and its prehistory including standing stones, duns and brochs, right through to the Celtic Church and the Viking era. Moving on to the island's more fully recorded history, the castles guarding the Sound of Mull are featured, complete with a cutaway model of Moy Castle. Mull's maritime heritage is not overlooked, and the Tobermory Galleon, the Spanish Armada vessel that sank in Tobermory Bay complete - according to some accounts - with a hold full of treasure, receives detailed attention. 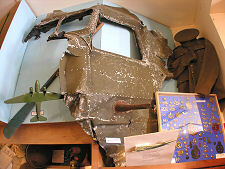 As does, from another era, the Douglas DC-3 Dakota which crashed on Ben Talla in February 1945, part of which is on display in the museum. 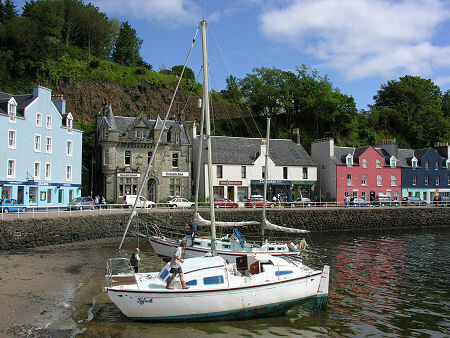 Also covered are the fishing industry which led to the birth of Tobermory; the island's schools and in particular Tobermory Public School; agriculture on Mull; the visit in 1775 of Dr Johnson and Mr Boswell; and much, much more. At the risk of repetition, it is amazing just what has been put on show in this fascinating little museum.